"I believe that life is like a path. We walk along it, rarely seeing beyond the next bend. All that I can say for sure is that I know where I started. Cheerful Helpers helped me get a solid footing on life. In this school, I learned the value of friends, the awe and triviality of everyday life, and a fundamental skill set that has followed me through life. From Cheerful Helpers, I was recommended to my elementary school, a school that in turn introduced me to my middle school and high school. In this sense, my path so far has been illuminated, the next step always visible. Right now, I’m a high school senior with straight As. I’m also a merit scholar whose been accepted into several colleges and plans on spending a gap year in Japan. As I leave the circle of protection that I have always known, the future seems a bit less clear but no less bright. Whatever lies beyond the next bend, I know that the lessons I’ve learned will let me rise to the occasion. I owe this all to the first steps I have taken down this path, to those that the Ellens have helped me to take." "It is hard to believe that it has been a dozen years since Jordan graduated from Cheerful Helpers. Our experiences and the lessons we learned from that small, intimate, and nurturing environment are still with us today. Jordan is now over 6 feet tall, a senior at Bridges Academy in Studio City, and a delightful and caring human being. He just completed his college applications and was recognized as a National Merit Scholar Finalist. The foundation that he received at Cheerful Helpers, along with hard work finding the right schools and the right professionals since then, helped him to emerge as a brilliant, thoughtful young man. He is a gifted writer (mostly science fiction), a fabulous performer, and he dreams of a future in psychology or medicine. He is still a quirky, interesting kid who has his own perspective on the world around him but he feels good about himself, confident in what he is able to achieve, and comfortable in his own skin. We know that Cheerful Helpers was a critical part of our journey to this point and we continue to be thankful to the teachers, counselors, and staff for the amazing gift they gave to our family." "A day doesn't go by that Jess and I don't think about you guys and all that Cheerful Helpers taught us...Sam's now a happy, thriving third grader in public school with pretty much just psychological services and speech & language. I don't think his principal and teachers believe us when we tell them what our lives were like back when he was three. Remember when he couldn't handle 'Hi Ho Cherry-O?' Now he's in both Chess Club and International Games & Toys Club at his school. And last week he performed in the third graders' musical production where he had one of the few speaking parts and square danced with a girl. Watching the show, Jess and I didn't dare look at each other for fear of bursting into tears and seeming like freaks. (Again, no one here understands how far he's come!) His teachers report that he's a joy to have in class, that he volunteers for absolutely everything, that he isn't afraid to try new things. They marvel at his ability to express his feelings. He's also swimming competitively and taking guitar lessons and Taekwondo. And he played basketball this winter and wants to play soccer in the fall even though he knows he hasn't been especially successful with either sport. He works so hard, and we're so very proud of him. Oh! And he has three good buddies who are in his class, neuro-typical buddies, who have him over for play dates. He's just one of the guys in the bright, nerdy gang. But these friendships are nothing compared to the one he now shares with his little brother, Joe. They're as close as any siblings I've ever seen. Were it not for you guys and Cheerful Helpers, none of this could have been possible. Thank you. Thank you for everything you've done for our family. And please know that the work you do, your daily work, is remarkable and transcendent." Dorrie Lamarr - My experience as a trainee and intern at Cheerful Helpers has been invaluable. The staff's inclusiveness and collaboration adds depth to a lifelong learning experience for anyone in the mental health field. 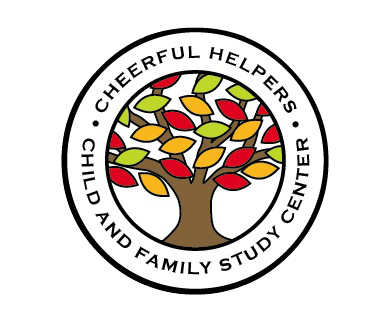 As an MFT intern, the Cheerful Helpers Team offers continual support while generously fostering the opportunity for me to find my own voice as a therapist. Diana Georger - My internship at Cheerful Helpers has set a standard for commitment to the client and family that will be the basis for my career. It is a unique internship in that it has offered me an opportunity to learn collaboratively every day with staff and fellow interns in a therapeutic classroom, publicly. I did not learn behind a closed door. For the past three years, instead, I had the unique (and sometimes uncomfortable) opportunity to be witnessed and supported everyday in the presence of more experienced and less experienced mental health professionals. We all worked together with the children. The experience reinforced for me the importance of a multidisciplinary team as well as the valuable impact of several therapists working with, and observing the same child, and further, in Supervision, discussing what was observed each day. 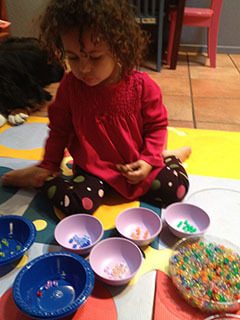 The classroom was fluid and the four hour day was rich with interactions between children, between therapists, and between children with therapists. There is a tremendous opportunity for study here which includes the CH Social Skills model, exceptional play therapy experience, co- facilitating family sessions, BEIG groups, parent group, Case Conferences, written evaluations for Regional Center and IEP's. Megan Lewis - My internship experience at Cheerful Helpers has allowed me to learn and grow in a way which mirrors the process of the families with whom we work. As someone who is new to the profession, I am grateful for the inclusive, collaborative process in which these programs are facilitated. The therapists, social workers and special Education teachers are inspiring in their ability to care for and grow these children in a way that cultivates independence, self-awareness, resilience and pride. To sit with a child while he or she struggles with a challenge, to lend them language through narration and bear witness to their experience is profound. To listen to a child find their voice and express their feelings is profound. To watch a child come through this program, growing and changing, leaving with tools they acquired along the way is magnificent. At Cheerful Helpers they grow and care for their interns in the same way. I am truly grateful for the education I have received here.